It’s a new year, but do we really need a “new” you? No. But a gentle adjustment might feel good in all the right places. If so, we want to help you want tackle the year ahead with your best self. That’s why we’ve created a toolkit called REBALANCE. This includes weekly tips and guidance to serve you mentally, emotionally and physically. To start, we’ve recruited our in-house holistic health coach to get you started! Take the Sphere of Life assessment (you’ll find the link below). Even if you’ve taken it before, remember, we’re focusing on where you are right now. Answer the 5 questions that follow the assessment. Check out our Charlotte’s Web Rebalance bundles. These health and wellness bundles feature a powerful tool for change that we’re psyched about -- the Five-Minute Journal-- in addition to our best CBD oil, balm and capsules. Follow our blog and socials in the weeks to come! We’ll have more coaching, and we’re working with even more partners to help you bring about positive change in 2019. Now, get started! Kick it off with this video and keep reading below to get coaching, first-hand. Hello! I’m Tamarah Saif, VP of Human Resources at Charlotte’s Web, a health and wellness company, and a certified holistic health coach through the Institute for Integrative Nutrition (IIN). The beginning of the year is a time when many of us make resolutions to do or be something else. We want to restart/refresh/renew/revitalize… something. Today I’d like to talk about the idea of “rebalance” in 2019. At some point in our lives we all get out of balance. If we give ourselves a moment to reflect, we may realize there are times when we aren’t as balanced as we want to be in one area or another – be it the emotional, mental, and physical aspects of our lives. But let’s face it. Most of us don’t even have time for reflection. We’re too busy living life to take time to focus because we have families, careers, and responsibilities. Basically, life gets in the way of optimizing life. Let’s look at the key areas of life and begin to take stock of where you are. A tool I use for myself and my coaching clients is the “Sphere of Life.” Diverse areas of life are listed around a sphere to help reflect on those things that call your attention every day. (Though whether or not they actually get your attention daily is another matter. Fear not, we’ll work on that later.) Before we jump into the exercise, let me talk a little bit more about balance. Quite simply, the definition of balance is unique to each individual and it changes over time! And most importantly, what may feel balanced for one person may actually feel stressful, boring, or “off” for another person. The Sphere of Life exercise will help you clarify priorities for goal setting this year so that you can plan your life according to your personal definition of balance. What excites you in your daily life? What fuels you to keep moving ahead? The exercise will help you discover which areas in your life you might be dissatisfied with or missing. 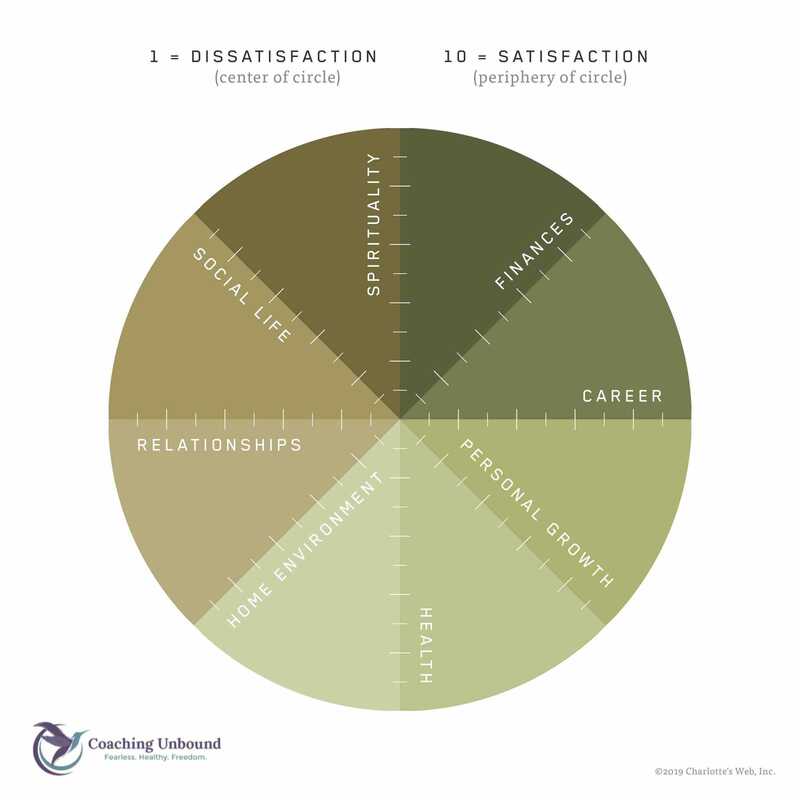 You will look at your overall “sphere” and determine where you need to adjust and rebalance so that you are more satisfied in those unbalanced areas. It’s a simple exercise, but it does provoke thought and reflection. I encourage you to find a quiet space, take the time to reflect on all you have going on, and determine where you are in each area at this moment. Don’t think about where you want to be or where you should be. Don’t think about anyone else. This is about you and your truth at this moment, at this time in your life. This is what helps you determine how to focus your Rebalance. Place a dot on the hashmark that indicates your level of satisfaction in each area using a scale of 1 to 10. One is near the core of the sphere and indicates dissatisfaction, 10 is towards the edge and means you feel great about that area. For example, if your social life is really abundant, place a dot on the hashmark somewhere towards the outer edge of the sphere. Connect the dots to see what your Sphere of Life looks like. Take some time to reflect on the shape. Are there areas where the shape dips in or points out in an extreme in either direction? Where there any surprises? How do you feel about your life as you reflect on your shape? The second page of the exercise includes a few questions designed to help you understand your shape more, identify imbalances, and determine where to spend more time and energy to create the balance you seek. As you work through the assessment and the weeks of guidance to come, think about: what would a balanced sphere look like to you for 2019 and beyond? In our next segment I’ll talk about setting your intentions and working toward your own personal Rebalance for 2019.